The BOUNCE BACK CHAIR - Sit and Bounce for a great aerobic workout at home or office. Bounce Back Chairs are MADE in the USA. The Bounce Back Chair is the BEST Fitness and Exercise Chair & Rebounder for low impact exercise and the most EXCITING Exercise Concept developed for the twenty-first century. It combines the FUN of a mini-trampoline in a SAFE and comfortable chair, designed especially for those individuals looking for an EXERCISE CHOICE that simply works for the most of us who typically hate to exercise, and also for the exercise 'pros' who love a good, moderate to strenuous, aerobic workout. This world-class exercise chair is AFFORDABLE and easy to use. The Bounce Back Chair is helping people to get back on the Road to Fitness in a way no other exercise machine has! The unique technology and benefits similar to that of using a mini-trampoline in an easy-to use chair have a positive effect on everyone who uses it, but especially those individuals who have difficulty with other forms of exercise. Seniors love using it because of the reduced risk of falls and low impact on those sometimes painful knee and ankle joints. Autistic kids and adults think it's fun and enjoy bouncing on a Bounce Back Chair. It's more fun than work, for all of us and a form of aerobic exercise that most users look forward to doing on a regular basis, come snow, rain or shine, in the comfort of you own home... and at your convenience Stressed out in a high pressure job? Put one in your office for a refreshing "get the stress out" break. That's the nice part about using this exercise equipment - you don't have to go to the gym, and you can exercise anytime, anywhere you have placed the Bounce Back Chair (very small footprint and easy to move). Sit and bounce gently or do a strenuous workout. Either way you will benefit from moving every part of your body, instead of just sitting in an office chair all day long. Using the Bounce Back Fitness and Exercise Chair may also serve as a stress reducer in this fast paced world; you just feel better and are more refreshed, even after the most simple workouts. You can simply "sit and bounce" making this world class exercise chair the 21st century equivalent of the old-fashioned "rocking chair" with much better results. There is only ONE CHAIR frame with various weight options for springs, and seat options for the original sling seat or the hard seat, all manufactured in the USA by AllFit Enterprises, LLC, however, this outstanding piece of rebounding aerobic exercise equipment has been sold under many different names since it was first introduced: Bounce Back Chair, The Bounce Back Chair, Bounce Back Fitness Chair, The Bounce Back Fitness Chair, The Fitness Chair, Bounce Back The Fitness Chair, Sit N Bounce, Bounce Back Exercise Chair, Autism Bounce Chair, Autism Bouncing Chair. The products being sold on this web site are the original Bounce Back Chairs, which have been sold continuously under one name or the other, "Bounce Back Fitness Chair" or "Bounce Back Chair", by Design Plus, Authorized Dealer/Distributor, since the late 1990s. Improved Circulation: By stimulating the flow of lymphatic fluids throughout the body by as much as 10 times their normal rate, use of the Bounce Back Chair may assist the body in removing toxins, strengthening the immune system, and building strong, healthy cells. Blood circulation and oxygenation may improve through exercise. "BOUNCE BACK" to better health and fitness with the Bounce Back Chair! Practically 'zero' impact exercise rebounding can be safely performed by just about everyone, in the comfort of your own home. Zero impact Bounce Back Jogging may provide aerobic conditioning and tones hips, thighs, and abs with less impact on your knees and ankles. You will get a Bounce Back Fitness Chair Training Video with purchase of your Bounce Back Fitness and Exercise Chair. NASA studies confirm the benefits of redound, or rebounding exercise. The Bounce Back Chair is almost comparable to a trampoline rebounder, except there is little impact upon the knee and ankle joints which is a definite plus for everyone engaged in rebounding exercise. The Bounce Back Chair may help to increase muscle mass and tone; elevating the heart rate gradually and steadily, enhancing cardiovascular fitness. Exercise generally promotes deeper breathing. Non-impact aerobics (estimates are up to 600 calories burned / hour - varies from individual to individual); exercise increases metabolism. The Bounce Back Chair can be enjoyable and fun to use; exercise with greatly reduced discomfort or pain. Have fun bouncing off the unwanted pounds using The Bounce Back Chair (rebounding exercise) in the privacy and comfort of your own home. Exercise while watching your favorite TV program and enjoy exercising on a regular basis. • ADDITIONAL SHIPPING CHARGES will be billed prior to shipping outside Continental USA (48 states)*. • Contact Phone # required by FEDEX. 1. Standard Bounce Back Chair - Sling Seat w/ Regular Springs #SSR - Minimum recommended weight is 100 lbs to 250 lbs approximate maximum. This 'fixed' sling seat comfortably fits most people who are in 'normal' proportion (height to weight ratio). Price: $495.00 (FREE shipping within continental USA*). 2. Standard Bounce Back Chair - HARD SEAT Upgrade w/ adjustable back straps and Regular Springs #HS - Proportionately heavier people (weight:height ratio) sometimes prefer the padded hard seat with adjustable back straps which is more comfortable for people with wider hips/back. (100 lbs - 250 lbs). Allow minimum 1-2 weeks extra, for delivery. 3. Heavy Weight Bounce Back Chair Sling Seat with with ADJUSTBLE back straps and Heavy Weight Springs #HWSAS - Approximate weights - 200 lbs - 350 lbs (maximum recommended). Springs are not 'better' than regular weight springs, but they do have greater tensile strength, requiring heavier weight to bounce well. Please note: this is the only sling seat with adjustable back straps to more comfortably seat people with proportionately wider backs and hips to height ratio. THIS IS A SPECIAL ORDER - Please allow additional TWO WEEKS for delivery! 4. Heavy Weight Bounce Back Chair - HARD SEAT Upgrade w/ adjustable back straps and Heavy Weight Springs #HWHS - Approximate weights - 200 lbs - 350 lbs (maximum recommended). The padded hard seat with adjustable back straps allows for wider backs and hips. shipping outside Continental USA (48 states). *Email for ADDITIONAL INTERNATIONAL, ALASKA or Hawaii SHIPPING RATES. Please include your complete address so we can give you an accurate shipping quote. Need a REPLACEMENT Seat or Set of 4 Regular, or Heavy Weight, Springs? Why buy a Bounce Back Chair? In our opinion, it's the BEST Fitness & Exercise Chair and Rebounder on the planet, for "bouncing back" through exercise to fitness and health! 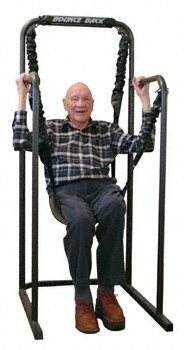 My Dad, pictured at age 94, was handicapped but able to use a Bounce Back Fitness Chair. Many users are over 70 and well into their 80's and older. Because you can use The Bounce Back Chair gently or vigorously and you sit while gently bouncing to get ready for the next exercise, people with less strength find the Bounce Back Chair easy and comfortable to use. You sit down and enjoy exercising and relaxing at the same time. Physical activity, at any age, improves one's quality of life, physically, mentally, and emotionally. Give a Bounce Back Chair to your parents or grandparents. Using a Bounce Back Chair at any age, helps one stay mobile, more flexible and improves circulation. Enables seniors who use it on a regular basis to stay independent and enable them to feel more energetic from exercising. It's exercise they can enjoy, and usually do, without assistance. Advantages and FAQs listed below are per the manufacturer. DIABETES - Increases circulation to feet and legs. Fun weight control exercises. You can exercise while you watch TV or listen to music. SENIORS - Exercise increases circulation and muscle tonality; safely strengthens bone and increases calcium absorption; easy on hips, knee and ankle joints with virtually no impact. Weight bearing is taken off the legs. Overworked, stiff, or injured joints are free to move without as much strain as with other rebounding exercise. • MS, FIBROMYALGIA - Secure and safe exercise modality; stronger muscles can be used to exercise the weaker ones. • ARTHRITIS - Exercise may help improve range of motion and circulation, which helps reduce pain. • CHRONIC FATIGUE - Self regulating exercise intensity; subtle whole body activity. • CFIDS - Advantages may include helping to correct dysautonmia, the dysfunction of the autonomic nervous system that underlies many of the symptoms in CFIDS. The up and down motion essentially regulates autonomic tone and improves the autonomic nervous system. • PARKINSON'S and STROKE - Secure and safe exercise modality; unaffected by tremors; effective even with activation by only one side of the body. Recommend use of 'safety strap' to help user remain in the seat while bouncing, and supervision of an attendant, while bouncing and for chair transfers. • CARDIOVASCULAR HEALTH - 65% of maximum heart rate may be achieved within a few minutes - in a controlled, zero impact activity. • BLIND or PARTIALLY SIGHTED - A more secure exercise modality; allows working of every muscle group without changing any settings. STRESS REDUCTION - Through the gentle bouncing motion of the Bounce Back Chair you will experience a wonderful release of stress and a deep feeling of relaxation. Reducing stress can relieve pain in muscles and joints as well as improving mental stability. STIMULATES LYMPHATIC FLOW - The lymph system is literally your body's 'Tree of Life'. Lymph fluid is clear and surrounds every cell in your body. Its function is to neutralize, remove or dissolve the toxic wastes that build up in your body and provide your cells with a clean environment in which to perform their life building tasks. When the lymph system fails to function properly, excess fluid and poisons build up in the body and pain, loss of energy, infections and disease can take place. The Bounce Back Chair may help stimulate the activity of the lymph system and help it to perform its function more effectively, speeding up the flow of lymph fluid by as much as ten times, increasing your body's ability to eliminate toxins and provide needed nutrients to each cell. Exercise combined with rebounding activity produces enhanced circulation of lymph flow. STIMULATES BLOOD FLOW - The gentle bouncing motion experienced in the legs and arms whole sitting in the Bounce Back Chair, stimulates the muscles in your thighs, knees, calves and ankles, increasing the circulation of blood to legs and lower body. Some individuals experience increased feeling in their hips and legs. Better circulation provides more warmth in your hands and feet. Is this really exercise? Yes. As with any form of exercise, how much energy you burn and the benefits you get will depend on how much you put into it. Does it really build muscle? Yes. There are exercises for building muscles in the arms, shoulders, back and chest. There are others for building muscles in the abs and legs. Can I do aerobics? Does it really help my heart? Yes to both. At beginning levels of use of the Bounce Back Chair, the heart rate will rise to 60% to 65% of its maximum heart rate in a few minutes. Will it help my arthritis? Apparently. We receive frequent phone calls from "Bounce Backers" who report reduction of their pain and stiffness from arthritis. My mother is 76 years old. Can she use it? Yes. But, please, consult your health care professional before starting any exercise program. How long should I use it? How often? For beginners, we recommend 10 to 15 minutes at a time, once or twice a day, for the first couple of weeks. How hard is it to put together? Easy. If you follow the instructions and do it yourself, it should take about 10 minutes. Get a world-class aerobic rebounding workout without adversely impacting hip, knee, and ankle joints. Exercise SITTING DOWN! are included with all Bounce Back Chairs. Shipping weight - 48 lbs. Single device, single setting: No motors, weights to change, positions to adjust, or elastic bands to move. The Bounce Back Chair can replace several other exercise machines. Therapeutic Exercise: Some private insurance companies will cover all, or part, of the cost with a Doctor's prescription under CPT Code #97110 Therapeutic Exercise, so please check with your physician, and insurance carrier for possible reimbursement. Virtually No IMPACT on Knee or Ankle Joints. Weight bearing is taken off the legs. Overworked, stiff, or injured joints are free to move without strain. Adaptable: Bounce Back Chair can be adapted to almost any body condition by usage. Use your credit card even if you don't have a Paypal account (may incur 24 hr waiting period to validate card if you don't already have a Paypal account). Please NOTE: DESIGN PLUS is an authorized, independent distributor for the manufacturer and makes NO medical claims, expressed or implied. Suitable application of the Bounce Back Chair is solely the responsibility of the individual user. Please consult your health care professionals before beginning any exercise program. Returns require a Return Authorization and will need to be returned in original carton and received in salable condition within 30 days of purchase date. Shipping charges cannot be refunded and purchaser will pay all return insured shipping fees. Returns (other than for manufacturer's defect) will be subject to a 40% RESTOCKING FEE and returns will only be accepted on chairs purchased for PERSONAL USE, not commercial use, which are returned to the warehouse in salable condition, within 30 days of purchase date. NO RETURNS allowed from International destinations outside of the Continental USA, Alaska or Hawaii. SPEICAL ORDERS are NOT returnable for a refund. Bounce Back Chairs are ideal for Seniors, especially if other forms of exercise are not available to you due to lack of mobility. We do not give out, lease, or sell your information, except as necessary for delivery of your purchase, or as required to do so by law enforcement. are owned by their respective companies.